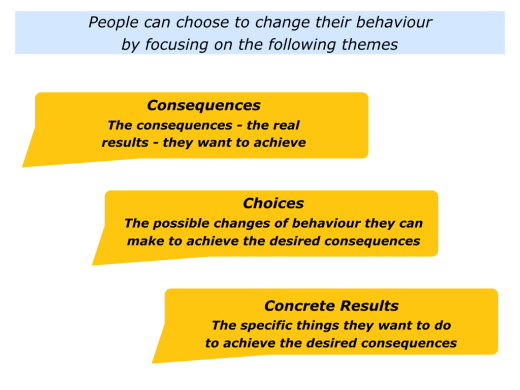 There are many views about what motivates people to change their behaviour. Some individuals change, for example, when they feel that doing so will bring them more pleasure and less pain. To focus on the consequences of their behaviour rather than come across as criticising them as a person. To focus on the consequences – the real results – they want to achieve. 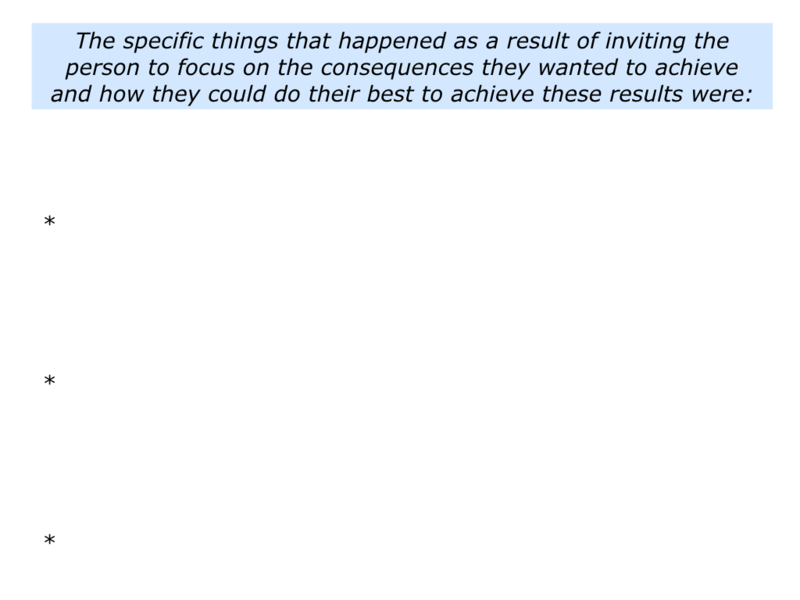 To, if appropriate, help them to explore how they can do their best to achieve these consequences. Such an approach comes with several health warnings. The approach only works if it is done at the appropriate time and in the appropriate way. It is more likely to work if the following conditions are in place. The person needs to be motivated and willing to try other ways to achieve their desired results. The person needs to respect the individual or group who is trying to help them and believe that they have their best interests at heart. The person needs to have the messages given to them in a way that they can accept and use to achieve their desired results. Looking back, can you think of a time when you may have adopted elements of this approach? It may have been when a person asked for your help with a personal problem. Alternatively, it may have been when you acted in a professional capacity. You may have needed, for example, to invite a person to decide if they wanted to demonstrate certain kinds of behaviour in order to do their job properly. What did you do in the situation? How did you avoid coming across as criticising or analysing the person? 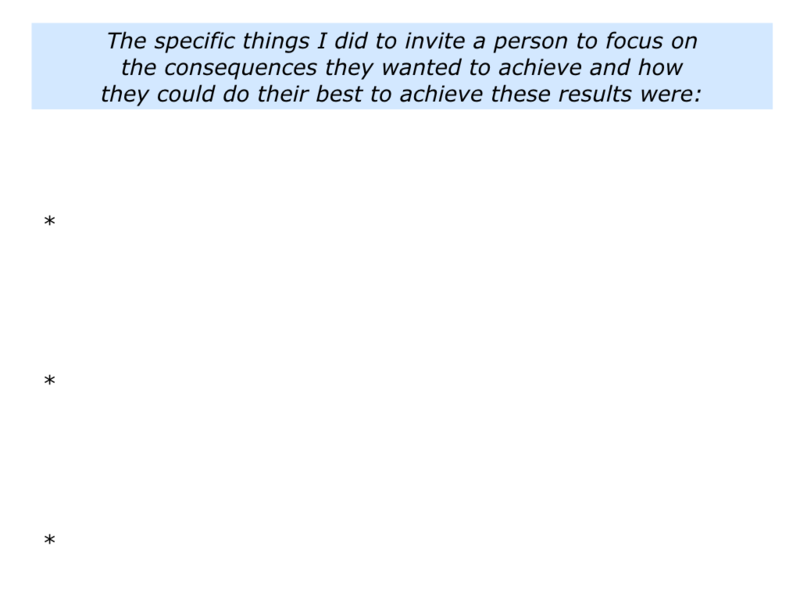 How did you instead help the person to decide what consequences they wanted to achieve? 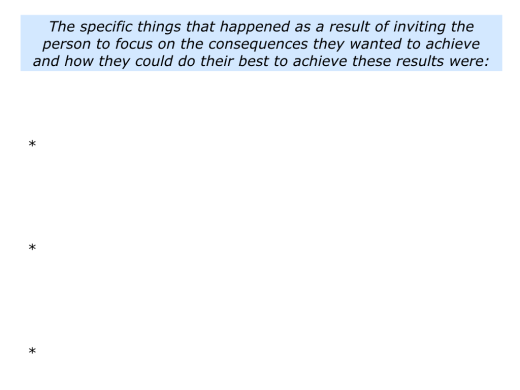 How did you help them to explore the choices they had for trying to achieve these outcomes? 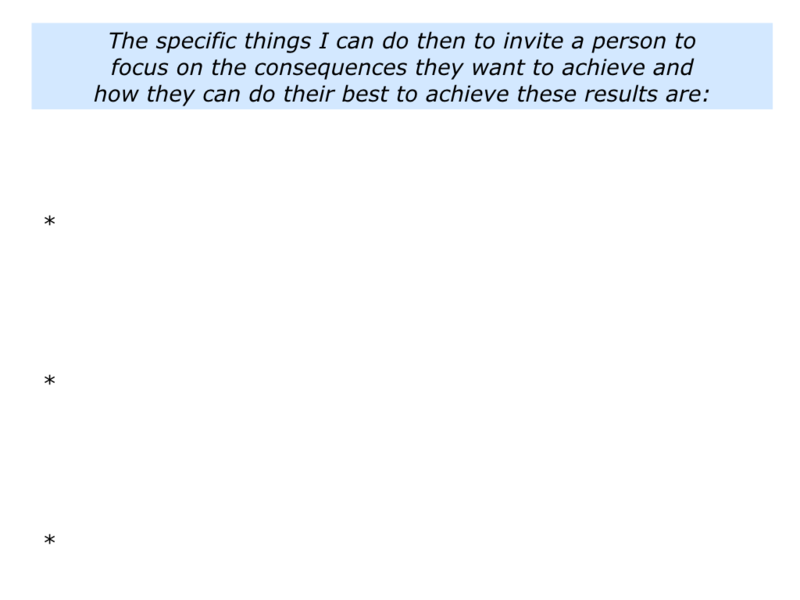 How did you help them to, if appropriate, clarify an action plan for achieving the desired results? People seldom change overnight, so the person may or may not have adopted a different approach. You may have simply helped them to look at their possible options for going forwards. It was then up to them regarding which route they chose to follow. 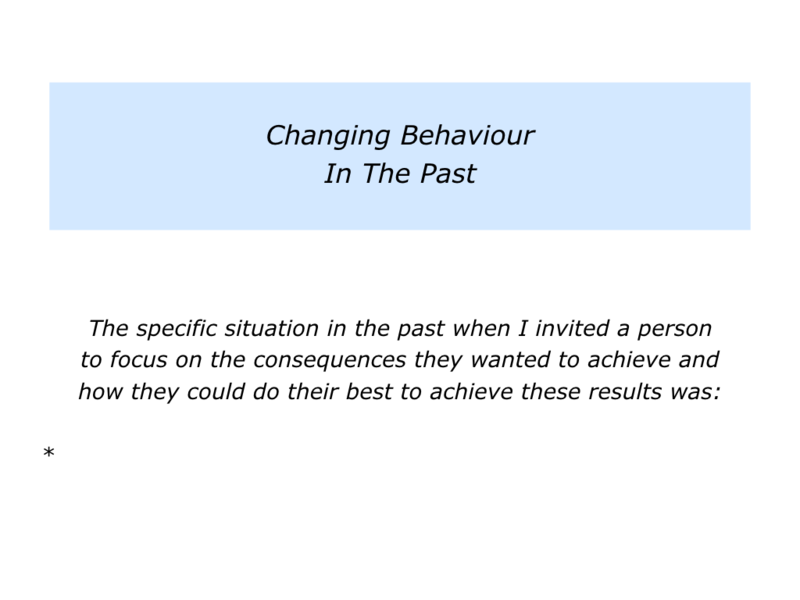 Describe a specific situation in the past when you helped a person to focus on the consequences they wanted to achieve and how they could do their best to achieve these results. Describe the specific things you did to take these steps with the person. Describe the specific things that happened as a result of taking these steps with the person. Imagine that a person has asked for your help in tackling a challenge. They may want to develop a healthier life-style, build better relationships with colleagues or change self-defeating behaviour that is hurting them as a person or professional. Imagine that the person is prepared to take responsibility for their actions. They are also motivated to explore their options for going forwards. One approach is to guide the person through the following framework to help them to develop. To clarify what they are doing at the moment – such as the way they are behaving – and the consequences. To look ahead and clarify the consequences – the outcomes – they want to achieve in the future. It is important to explore these things in a non-judgemental way. At the same time, however, the person must be prepared to take responsibility for their behaviour and want to get a different outcome. Let’s explore one real-life example where this happened. Normally I only work with people who take the initiative to ask for sessions. On this occasion, however, a company asked me to work with a potential peak performer. I agreed, but on the condition that it would be important to make clear contracts with the person. They must want to tackle the particular challenge and work towards achieving an agreed picture of success. Tom, a top sales person, was great with customers and always exceeded his targets. In some interactions with colleagues, however, he came across as dismissive. During meetings he talked across others and did his emails whilst they were talking. He had a strong personality and could be inspiring, especially when talking about future possibilities for the company. On the other hand, he could also be intimidating. Such swings in behaviour raised question marks about whether he could achieve his ambition to be Sales Director. Tom and I met for an initial chat. After a few minutes I explained the deal regarding us potentially working together. Here is a summary of the things I said to Tom. You have a strong personality and can be very inspiring. On some occasions, however, you can also be intimidating. Bearing this in mind, you may face a choice about the possible roads you want to travel in your career. Tom said that he wanted to develop so that he could lead large teams. This involved behaving in a professional way towards all people. Sometimes this might be difficult if he got impatient with people, but there were skills he could learn to deal with such situations. On occasions this might involve learning how to channel his personality, rather than change his personality. Tom said he wanted to go this route. So we made a contract to work together towards achieving his picture of success. 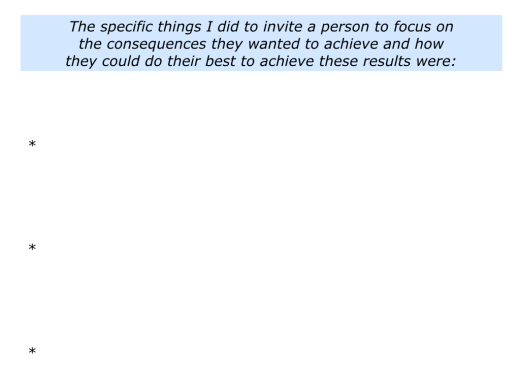 Tom and I clarified the outcomes he wanted to achieve. He began by tackling the exercise called My Stakeholders. This involved him going through the following steps. Clarifying the key stakeholders he wanted to satisfy – such as his bosses, colleagues and customers. Clarifying the actual words he wanted them to be saying about his contribution in three months time. Tom completed each of these sections. Looking at his managers, for example, he wanted them to be saying the following things about his contribution to the company. 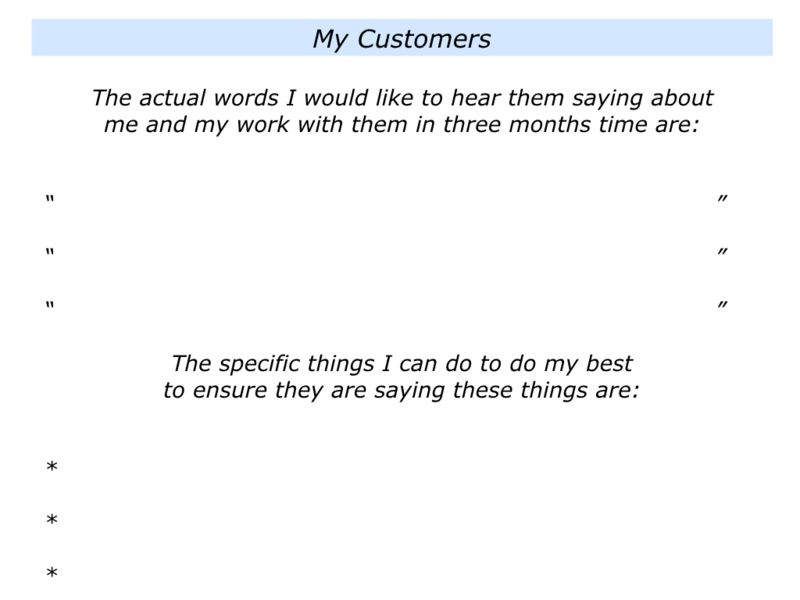 Tom continues to hit his sales targets, is good at managing upwards and gets good feedback from his colleagues. He is showing the ability to be a good Sales Director. He keeps his managers informed about his department’s progress and makes sure there are no surprises. If there are challenges, he presents possible solutions. He asks if people have any other suggestions and is willing to take on board ideas. He makes positive contributions to the leadership team meetings and shows that he thinks strategically. He understands the company’s strategy and goes out of his way to help other departments to succeed. He is well regarded by his peers and colleagues. They say that he shows them respect, listens to their views and does practical things to help them reach their targets. He has become a respected colleague and people see him as a good contributor to the company. Tom worked through each of the sections and produced a long list of desired outcomes. Bearing in mind what he could control, we explored the practical things he could do to achieve these results. The next step was to look at how to get some quick successes. He then produced a concrete action plan regarding how he would behave towards his managers, colleagues and customer. 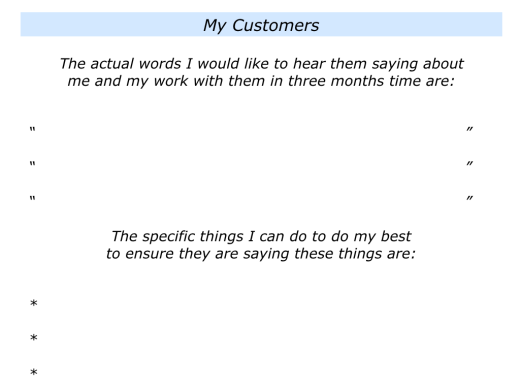 Tom could draw on the skills he used with external customers and apply these to his interactions with internal customers. Previously he had not seen the point of taking this step, but his dismissive approach had produced lots of collateral damage. He now saw how it would be beneficial to help his colleagues and peers to feel valued. 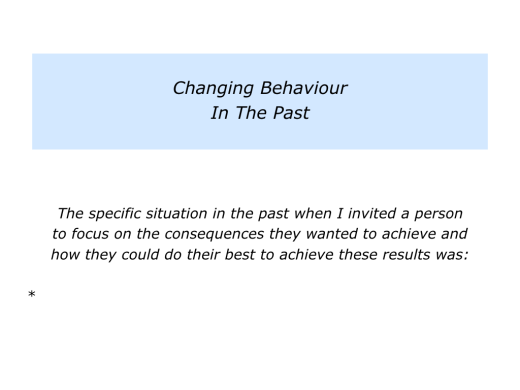 Different people cite different reasons for changing their behaviour. People are more likely to take this step, however, if they believe that doing so will increase their chances of achieving success. This is what happened with Tom. One key point is worth mentioning. 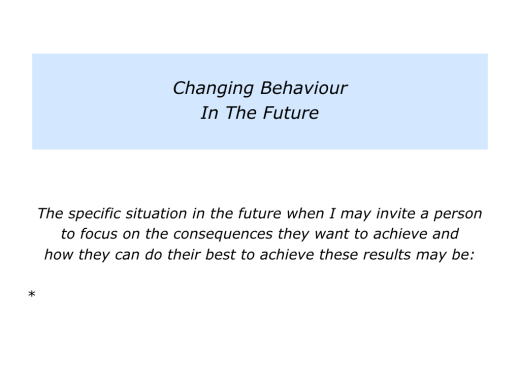 Many individuals do not change because they actually experience many pluses – pay-offs – that reward them for continuing with their present behaviour. A person may gain sympathy by finding people who listen to their problems, for example, and this gives them time and attention. They may also justify their own behaviour by blaming others and have an excuse for doing nothing until the others change. People may only change when they feel that the pluses outweigh the minuses. A person may choose to give up smoking because they want to live longer and see their grandchildren grow up, for example, rather than die early after relying on constant care from their relatives. The consequences approach is one I began using when working with recovering drug addicts in the 1960s. They each made choices about the route they wanted to follow. Each choice had consequences – both for themselves and for other people. 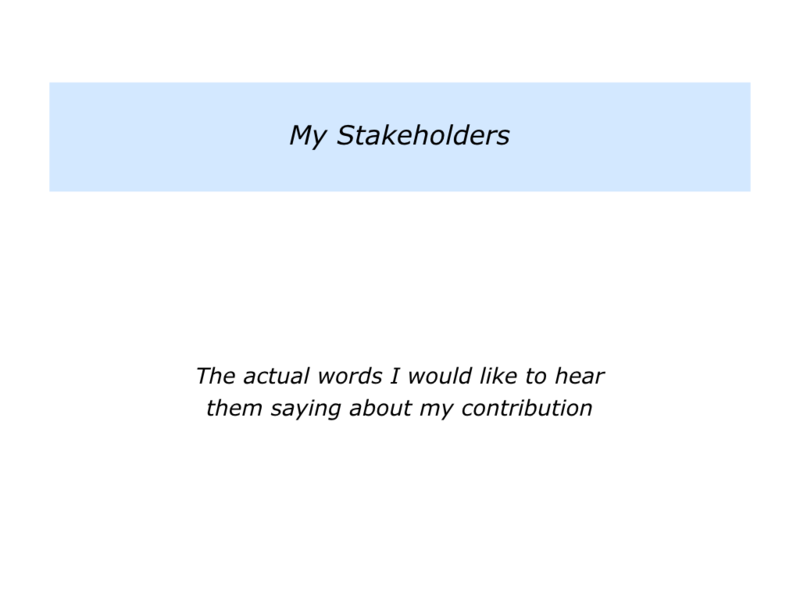 Over the past 50 years I have used it many times with individuals, teams and organisations. The aim has been to help them to decide what set of consequences they want. It has then been to help them achieve their picture of success. Different people use different questions to help others focus on developing or changing their behaviour. These questions frequently revolve around inviting the person or group of people to explore the following themes. What is happening at the moment? What are the consequences? What are the pluses and minuses of these consequences? What are the consequences you want in the future? What are the real results you want to achieve? 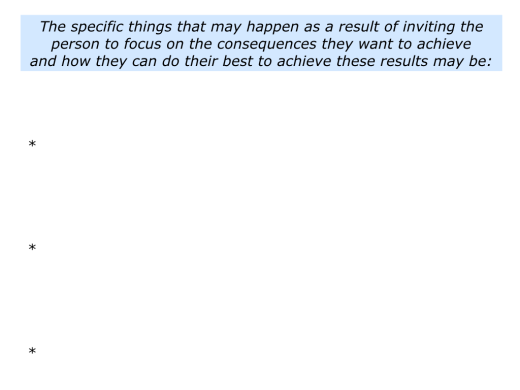 What are the desired outcomes? What will be the pluses and minuses involved in working towards and achieving these consequences? Looking to the future, which set of consequences do you want to achieve? Take time to reflect, then decide on your chosen way forwards. How can you do your best to achieve your desired outcomes? How can you encourage yourself on the journey? How can you get some quick successes? What are the specific things that will be happening that will show you have achieved the desired set of consequences? Let’s return to your own life and work. Looking to the future, can you think of a situation in which you may want to use this approach? This could be in your personal or professional life. 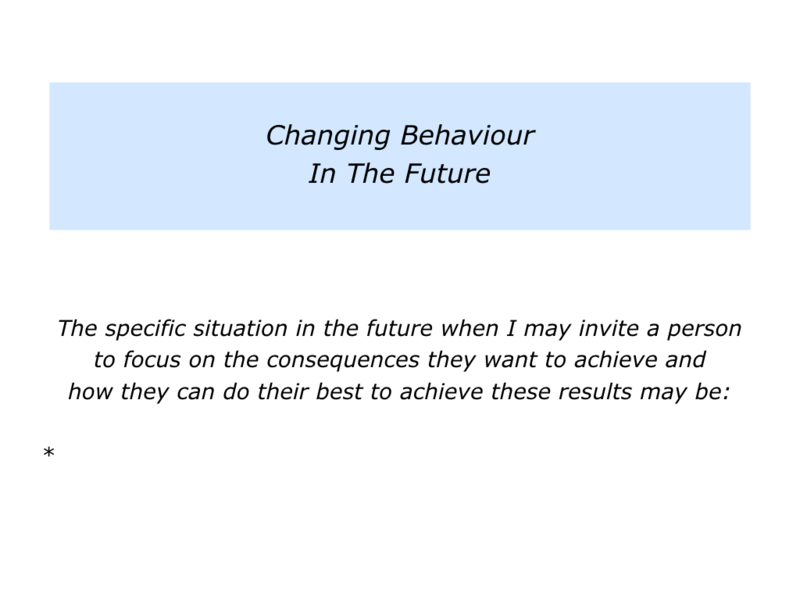 Describe a specific situation in the future when you may want to help a person to focus on the consequences they want to achieve and how they can do their best to achieve these results. Describe the specific things you can do to take these steps with the person. Describe the specific things that may happen as a result of taking these steps with the person.